Still the same, only different! Looks a little different around here, doesn't it? I've been tinkering around with the appearance of the blog. It seemed like it might be a good idea to put the magazine in as part of the frame, for instance, and since we got the capability to add an image to the header a while back, that's been on my mind. Well, of course then the colors had to change, and well.... here we are. It might be done. Or you might come back and see something completely different again. We'll see. It has been a very full summer. Both my sister and I have businesses, and we help each other. We also enable each other to continue to take on projects. Over the last year, both businesses have done some serious growing. We weren't really looking at that as we jumped into the farmer's market, signed on to teach more classes, and developed products. It's a fun ride, but as I look back at summer last year - filled with days of playing with the still, puttering in the garden, reading piles of books, and the occasional afternoon nap - it is clear that times have changed. This summer has been crammed. Not a lot of napping going on. One thing I've learned (finally) is to stop thinking that "as soon as we get "X" done, things will calm down." When we had the shop, that was our mantra. The problem is that while you're waiting to complete "X", other things are jumping onto the calendar. This is just an observation - not a complaint. When I quit the day job a couple of years ago, my days appeared to stretch out before me like a wide, empty highway. Someone dear to me told me that very soon I'd be wondering how I ever found time to work a full-time job. I laughed to myself. The first time I took an afternoon to read a book - not a reference book, a novel - I felt almost guilty. It was difficult to learn to adjust to all that time. The house was spotless. The cupboards were well stocked, laundry done and put away, and the gardens pristine. Ah, but that was "then". Now it's time to adjust again. All of my multi-tasking skills of the past seem to have gone to seed, and it's time to re-learn them. So we're back to making lists of things that need to be done. Back to planning when to fit things in. Back to knowing what day it is. Once again, I must use the whole day, and stop dawdling over the second cup of coffee. There is a difference, though. Almost everything on every list is something I love to do. The crossword puzzle for the next issue is all but finished, and I love typing it in and watching it come together. The Field Notes are rattling around in my head and just need to be unscrambled on paper. The soap we made yesterday will be cut, shelved, and the molds prepared for a new set of batches. Orders will be mailed out. The herb bead making class will be posted to the group, and the attendees invited. The new page for the website is formulating, and the updated sample articles will go up soon. The new items to take to market this week are labeled and sitting prettily on the shelves. And yes, even taking the kid out to practice driving has become enjoyable - now that I'm not digging grooves into the handrest with my fingernails. Even hauling out the checkbook to pay bills is satisfying, because I CAN. Somewhere in there, I'll step outside and gather jewelweed seeds, because I promised them to some folks on the list. There will be things along the way that will need me to take pictures, and those pictures will inspire some blog entries. The only problem is that in all of that, I just don't see any place for house-keeping. Heh heh... maybe I'm not looking closely enough. Dan and Betty Pillsbury - Friends in the news! The following is an article featuring some friends of The Essential Herbal (and I have fun bantering back and forth with Betty via email some mornings). Betty's words can usually be found somewhere in the List Article of each issue. Nice job, Dan and Betty! Btw - there were many more pictures of plants, but between my photo program and blogger.... well, we have some of them :-). When Betty Pillsbury ’s (http://www.bettypillsbury.com/) teenage friends were out on the town having a good time, she was in the woods. For Christmases and birthdays, she requested items like wildflower-identification guides. When she was 15, her mother gave her a recipe for a salve that had been Pillsbury’s grandfather’s. She was hooked, and began using herbs in food, medicine and crafts. 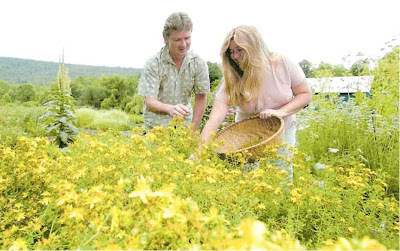 These days, Pillsbury’s love of herbs and flowers has grown into a passion that she pursues with her husband, Dan, at their home in the Schoharie County hamlet of Huntersland, which is outside Middleburgh. While Betty has been fascinated with growing plants almost her whole life, she found herself leaving garden after garden behind, in places like England, the high desert and the Great Plains, as she and her husband moved to various duty stations throughout the world during his 20-year career in the Air Force. “Moving from place to place, you know you’re probably not going to see that harvest,” Pillsbury said. All that changed when the couple purchased their 1840s home in 2001. They had discovered the area during a genealogy trip when they were stationed at the nowdefunct Griffiss Air Force Base in Rome. “We fell in love with its beauty,” she said of Middleburgh, and they decided to settle here. “We’ve really put down roots — literally and figuratively,” she said. When they purchased the property, it was overgrown with eye-high weeds, including cow parsnip, to which Dan is allergic. 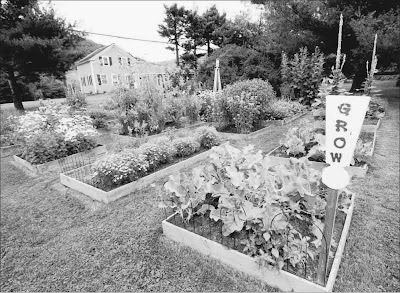 Slowly but surely, the couple cleared the land and transformed the three-acre property, filling it with gardens containing more than 250 different kinds of herbs as well as flowers, fruits and vegetables. Since Betty has rheumatoid arthritis, Dan builds her raised beds in which to plant. This makes it easy for her to sit on a wheeled garden tote to tend to the gardens. Some of the raised beds are made from old wood from the barns that had been on the property. Pillsbury describes her garden as “eclectic,” with a little bit of everything. There are herb gardens filled with not only staples like rosemary, thyme and tarragon, but speciality herbs like chocolate mint (yes, it does smell just like a peppermint patty) and lime balm. Whenever possible, Pillsbury starts the plants from seed herself. 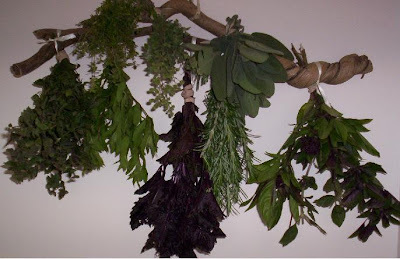 While she is able to harvest her herbs from May through October and likes to use them in cooking, Pillsbury, an herbalist, uses all of her plants for much more, including teas, oils, lotions, salves, balms, sprays and powders. Her garden has a cure for whatever ails. For example, her dwarf lemon balm has antiviral as well as calming effects. Ashwagandha is an Indian medicinal plant that is supposed to boost energy. Sage has antibacterial properties. Even plants that most disdain as weeds, such as stinging nettle, has valuable properties, Pillsbury said. The leaves can be made into tea or used in a potato soup, or the seeds can be made into a tincture that is supposed to help the prostate. While plants have wonderful medicinal properties, Pillsbury cautions that a person really needs to know what they are doing to use these plants properly, or use them under the supervision of someone who does. Besides herbs, the Pillsburys grow about 40 different kinds of roses in addition to other flowers. They are influenced by some of the places they’ve lived, including England. Pillsbury remembers standing in a 40-acre field of blooming lavender, breathing in the sweet scent. “You could just feel the relaxation wash over you,” she said. She has lavender in her garden, and in one section, she and Dan built a miniature Stonehenge, reminding them of the four years they spent in England. Besides the joy of growing different kinds of plants, Pillsbury enjoys the folklore behind them, too. For example, she might ask if you know just why Rapunzel was locked in the tower. It was because her parents loved to eat the roots of the rampion plant (an English kitchen garden favorite), and her parents used to send Rapunzel into the witch’s garden to steal it. One day, the witch caught her and locked her up. The Pillsburys also grow a variety of vegetables and fruits, including peppers, broccoli, tomatoes, cauliflower, pears, blueberries, elderberries, cranberries, cherries and apples, to name a few. Many of the plants are just starting to mature. For example, they are still awaiting the first harvest of peaches from trees they planted four years ago. A friend in Iowa had delicious, juicy white peaches. He gave Pillsbury some of the pits, and she was able to grow her own trees from them. All of the gardening is done organically, the Pillsburys say, using materials such as manure, compost and fish emollient. They’re also mindful of attracting wildlife to their property. They plant favorites of hummingbirds and butterflies, such as rose-scented bee balm. They also left a patch of land as natural meadow. Betty Pillsbury’s answer to the comment that all of her gardens look like a heck of a lot of work, she simply replies, “When you’re doing something you love, it’s not like work. There’s something satisfying about getting your hands in the earth.” From looking at their property, you might think that the Pillsburys spend all their time in the garden. But believe it or not, both Betty and her husband have day jobs. Dan works for a pharmaceutical company, and Betty is a textile artist. Her home is full of items she’s created, including an award-winning crazy quilt that was nine months in the making and was displayed in the White House one Christmas. She also travels around the country teaching crazy quilting and other textile classes, and she has appeared on HGTV’s show “Simply Quilts.” When she’s not sewing or teaching quilting classes, Pillsbury is making items from her herbs and other plants. She and her husband started their own business, Green Spiral Herbs. They sell their products at herb festivals and fairs, as well as online. Pillsbury also teaches classes where participants get to cook or make other items from herbs. Recently, Green Spiral Herbs received the status of “Botanical Sanctuary” from United Plant Savers, a non-profit organization dedicated to protecting native medicinal plants in the United States and Canada. 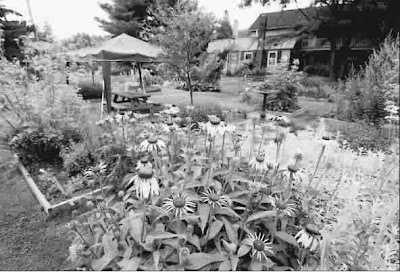 The Pillsburys grow many of the plants that are on the organization’s “at risk” and “to watch” lists, including American ginseng, bloodroot, echinacea, goldenseal, osha, trillium, wild yam, black cohosh, blue cohosh, arnica, butterfl y weed, mayapple, spikenard, white sage and wild indigo. 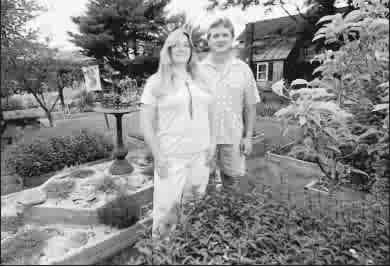 Dan and Betty Pillsbury are owners of Green Spiral Herbs in Middleburg. Together they pick from a patch of St. John’s Wort grown in one of their many garden beds. Dan and Betty Pillsbury’s Green Spiral Herbs was named a “Botanical Sanctuary” by the United Plant Savers, a non-profit organization dedicated to protecting native medicinal plants in the United States and Canada. This is my second summer here. There are still surprises popping up around the house. One of the first to greet me this year was calendula. Michele from Possum Creek Herb Farm sent me a package of seeds when I moved in last year, and *apparently* I planted them in the two front beds. I've searched for that packet over the winter, but since they did come up, my memory is just failing (surprise, surprise). The next plant to pop up and give me a grin was jewelweed - beside the porch. Some seeds must have taken root when I was cleaning the plant to stick into the still last year. Last year, I noticed a plant that had thick silvery blu-ish green leaves and some purple in the stems. It didn't do anything, so when it popped up again this year I didn't expect much. Well, it has flourished this year. The location is very sheltered, and perhaps it is growing like it would in other, more native regions. Here, we call two different plants "moonflowers". One is a vine that I've grown on a lightpost before. It is much like a giant morning glory. This one is a Datura, a relative of the Jimsonweed that grows throughout the fields, giving farmers headaches. Sniffing around Google, I've found that the plant growing outside the door has some interesting - if dangerous - distinction. Called Devil's Weed in The Teachings of Don Juan, it was used for it's hallucinagenic properties. Unfortunately, the quantity needed for that purpose is very close to the quantity that is lethal, so we won't be doing anything there. Besides, life is trippy enough all by itself. I REALLY don't need any help in that department. Another tidbit I picked up is from a VooDoo practice, where this plant was used to create a deathlike condition for three days, so that victims were buried alive conscious but unable to move or signal life. Lovely. Concombre Zombi. My daughter was thrilled by that, as she has some sort of zombie fascination. In any case, the flowers are really lovely little saucers that open in the darkness and emit a delicious fragrance. They draw sphinx moths (which, if you've been reading for a while, you'll know we are polluted with those strange little creatures around here) for pollination. This plant has proceeded to crawl across the side porch, and has just begun to bloom. It is covered with buds. Just in time for the upcoming full moon! Last week the family was due at my house for our weekly confab (Maryanne's house, the normal location, is torn up due to construction) and I started thinking about using some of the peaches for a dessert. I looked around for a recipe for a while, and eventually found a good cobbler recipe. A few tweaks here, a little change there, and it was delicious. The next day at our farmers market, Kharren, in the stand next to us, showed up with the most beautiful blackberries. With visions of another scrumptious cobbler danced in my head. I snagged a pint of those jewels! Melt butter into an 8" x 8" baking pan. Mix togethr flour, sugar, baking powder, and salt. Stir in the milk and egg. Pour batter evenly over the melted butter. Combine fruit, sugar, and spices, and spread over the batter. NO STIRRING. Bake 35 - 40 minutes at 350 degrees until the batter has risen to the top and is a golden brown. Serve warm with ice cream and/or whipped cream. Herb Teas in the August Chill? That's right. I said August CHILL! Now entering our third day of rain, the temperatures are so low that yesterday broke an all time record. How this will effect the garden is beyond me, and there will undoubtedly be some surprises. Last night there was a moment when I almost flipped on the heat, but opted for heavier clothing instead. Sitting here in my fuzzy slippers,it seems like a little talk about hot beverages might be in order. One of the questions we see most often on the list is about infusing herbs for tea (or various other herbal applications). When it comes to making a beverage, people over-think it. Way back in childhood, I remember finding mint tea and using it to brew up a drink. Many neighbors grew it, and it was easy to find wild in pastures and near streams. We would just bring water to a boil, take it off the heat, and plunk the leaves in there for a few minutes. Later, when I got "into" herbs, it appeared that there were RULES for infusion. Hmmmm... ok. The official rules (yes, that is my tongue in my cheek) state that leaves and flowers should be infused in water for 5 to 15 minutes. Some suggest then leaving the herb in the water overnight in the fridge and straining it in the morning. Roots and barks should be boiled for at least 15 minutes. Coverings should be used to keep the steam from taking away the good stuff. If you are making teas for medicinal purposes, by all means, research and follow the guidelines. If you're making herbal teas for pleasure - enjoy the process of your choice! I like to gather flowers and herbs during the summer. Once dry, they often get put into a large jar where they become a sort of "tea potpourri". Each cup has it's own character and flavor, depending on what gets scooped out for that cup. Right now, the lemon verbena is flowering, and I will dry the tiny blossoms to see what they taste like. The Tutti-fruity hyssop has delicious flowers, and they will go into the jar too. Lots of pineapple sage, echinacea, mints, and chamomile too. If the passionflower vine ever blooms, we'll put some of that in, along with vitex berries that will be here for the first time. I'm also on a search for elderberries, since mine didn't bloom this year, but I see them in the wild. Wander around your yard with a focus on teas and see what you can come up with. Basils are good additions, lemon thyme, mints, and roses. Go easy on things like sage and rosemary. Include them, but consider the strength of their flavors so they don't overwhelm your blend. Local Farm Stands - Delicious Local Eats! We were talking on the list about the book "Animal, Vegetable, Miracle" by Barbara Kingsolver, and I mentioned the wealth of farm stands in the area. All of the pictures that follow are within a 5 mile area. Most are much closer. I wanted to show some of the diversity in the set-ups, and also point out that in some of the pictures you can see how the honor system is in place. In the picture of the peaches, and again where the tomatoes are set out on the tv tray, the money jar is visible. It's not very clear in the picture with the umbrellas, but it's there. The signage is also diverse. Some is just written on paper, some on wooden hanging planks, and some is pretty professional. I've gotten a couple of inquiries as to what is included in the kit, so now that they are finished, I'm posting a picture of what you get. The kit is small but mighty! You will end up with lots of beads made from three separate botanicals, and enough ideas, instructions and leftovers to go on and create from there. The only thing we haven't included is water and a dish to mix them in. Three days left to order! Note - putting these kits together is going very smoothly, and shipping is a breeze, so we're extending the deadline for ordering until August 22!!! The class is over for now, but we have herb bead making kits on the website under Essential Favorites. You can register on the website by clicking on the button on the home page. The registration fee of $20 includes everything you'll need to make beads from 3 different herbs, instructions, recipes, and shipping (inside the US). Deadline for sign-up is AUGUST 15! Note - Deadline has been extended until August 22. The class will be held in the TEHclasses Yahoo! group from September 1 through September 7. Attendees will receive an invitation to the class (we'll use the email address you use to order unless you tell us otherwise) two days before the class begins. Kits should have all arrived by then. During the week of the class, there will be how-to pictures posted, files on the ingredients and ideas for use of the beads. Members may ask questions and also discuss the projects on the list. At the end of the week, the classroom will be closed. Please feel free to leave comments here if you have any questions! Last night we took our herb beads on the road, teaching the craft at The Rosemary House. The class was actually held next door at Sweet Remembrances - truly the sister tea room to the herb shop, as sisters run the two businesses. Hmmm.... that sounds familiar. We got there just a few minutes early and were treated to a short visit in the garden. The gardens behind The Rosemary House in late summer are breathtaking. The shop is now celebrating their 39th year, and the variety of plants in the garden is spectacular - the kind of garden that can only be achieved over the course of many years. Whimsy is the word best used to describe it. If you are ever in the area, you really have to visit! Be sure to stop under the "teapot tree" and sit for a spell in the giant teacup. There are various sections in the garden, some tranquil, some fanciful, and some just plain bursting with unusual fruits and flowers. We took several pictures, and they'll be showing up from time to time in the magazine. The class itself was held indoors (thank goodness for air-conditioning!). I found myself a bit disconcerted by the idea of trying to talk to several small tables. It seems that I've become so accustomed to writing instructions for crafts that I'll need to practice up my speaking skills again. Even so, the class was filled with enthusiastic participants. Fortunately the class hand-out covered the basics from start to finish, so I'm not TOO worried that anyone left shaking their head. My sister, Maryanne Schwartz, volunteered to come give me a hand, and that turned out to be a good thing. After we talked a little bit about the original rose beads - those that come out shiny black from being cooked repeatedly in cast iron - we discussed the ingredients that we would be using, how they work, and offered several options to make fragrant herbal beads that can be worn and/or kept as family heirlooms. The class came up one table at a time, and chose the ingredients from an array that were offered. As they settled in to begin work, everyone talked amongst themselves and we circulated around the tables to make sure everyone had the idea. We were surprised at some of the original shapes and sizes that were made. For the first time ever, several participants decided to make all of the beads before stringing them on the wire. That was a new one, and I think it must be a Mechanicsburg phenomenon. Now that we've completed the in-person class on beadmaking, we'll be getting ready to do the on-line version. I'll be posting more about that on Monday!